Did you know that it's almost Mother's Day? A marketing opportunity like no other that is celebrated all around the world (albeit on different days)? Although I don't do Hallmark holidays, it seems everyone else does so here's a few ideas for gifts for Modern Moms. 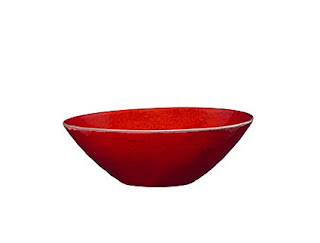 Exclusive New York emporium Moss has some fab suggestions for the design savvy including Kiln, enamel bowls and platters in half a dozen different colours from designers Elissa Ehlin and James Leritz. 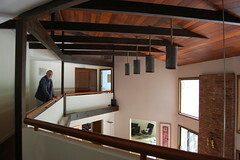 They are simple, yet vibrant and modern. Price range $85-$315. 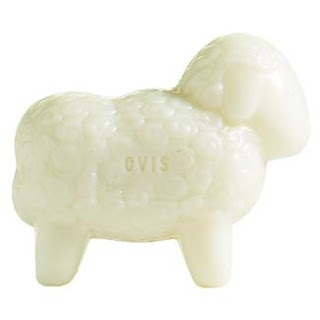 DWR has a fun lamb-shaped bar of soap made of sheep's milk $12, and something I would definitely want as a winter gift: a hot water bottle with an alpaca cover. Snuggly! From Design Public a really cute and unusual idea: Octopi Cups by design group Cake. In white on black or black on cream, they'd make great toothbrush holders for a stylish bathroom, too. $18 each. In case you need to know, here's what I would NOT love to receive on Sunday: a homemeade Oreo cake; warmed frozen croissants (especially a year's supply thereof); a personalized entertaining and recipe journal. Avoid here at all costs, you do not want to see my face if you have rush-shipped me their best selling Mother's Day gift: an All-Clad Waffle Maker! are you sure that isn't a sheep=shaped bread roll? 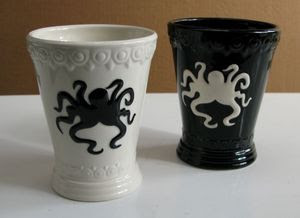 Octopi cups? Are those for Nadya Suleman? Do they have sheep-shaped bread rolls down under? Love the cups; you always manage to find the quirkiest things. you haven't read your sheep, have you?